2000 - UFCW Canada establishes the Young-Workers Internship Program, or YIP, which has since become the Canadian labour movement’s premier leadership development program for young workers. 2000 - Walmart workers in Jacksonville, Texas, make history by becoming the first Walmart employees to exercise their right to join a union. 2000 - Perdue chicken catchers join the UFCW to demand a voice on the job and a right to join a union. 2001 - Joseph T. Hansen elected President of Union Network International (UNI), an International labor organization representing 15 million workers, in 900 unions, in more than 100 countries. 2002 - Agriculture Workers Support Centre established in Leamington. Since then, nine more centres and mobiles centres set-up across Canada to assist and organize agriculture workers. 2003 - More than 70,000 food retail members across California forced on strike to protect healthcare benefits. 2004 – Meatpacking workers at Lakeside Packers in Brooks, Alberta, one of Canada’s largest beef processing facilities, win a hard-fought organizing campaign and become members of UFCW Local 401. 2004 - Joseph T. Hansen elected UFCW International President. 2006 - Agriculture workers in Ontario finally granted the protections of the Occupational Health and Safety Act as a direct result of UFCW Canada lobbying and campaign efforts. 2006 - Wayne E. Hanley voted UFCW Canada National Director. 2007 - UFCW Canada launches webCampus, the union’s award-winning, online education resource. 2007 - UFCW Canada establishes the Human Right, Equity & Diversity Department (HRED) to help lead the union’s diversification and inclusion efforts. 2008 - UFCW Canada offices of National Director and National Council President are combined to create the office of UFCW Canada National President. Wayne E. Hanley serves as the union’s first National President. 2008 - Walmart workers in Weyburn, Saskatchewan, certified as members of UFCW Local 1400. 2012 - UFCW Canada National President Wayne E. Hanley nominates Thomas Mulcair for federal Leader of the NDP. 2013 - Paul R. Meinema voted UFCW Canada National President. 2014 - Walmart is found guilty by the Supreme Court of Canada for violating its employees’ rights. Walmart abruptly closed its store Jonquiere, Quebec after workers there voted to join the UFCW. 2014 - Anthony “Marc” Perrone elected UFCW International President. 2015 - the UFCW Canada National Defence Fund (NDF) membership more than doubles in size as large retail memberships, from Loblaws in British Columbia, Alberta and Ontario, join the strike and lockout fund. 2017 - Agriculture workers gain right to join the union in Alberta, after Rachel Notley’s NDP government expands the province's labour relations act to include farm workers. 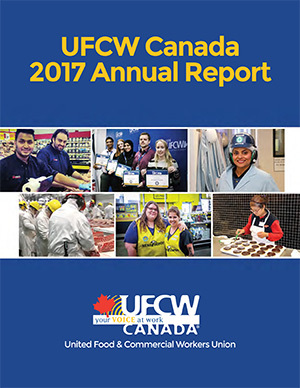 2017 - UFCW Canada National Convention unanimously passes resolution to reform composition of the UFCW Canada National Council to ensure gender equity.